In January of this year, one of the go-to online beer reference sites, Rate Beer, released its list of top ten new breweries as part of their annual awards. The results are based purely on the ratings given by the citizen reviewers on the site, so it's all very democratic if not a little biased towards the US. More on that later. Despite this it is very encouraging to see three British brewers in the top ten. There is always a chance that US breweries will dominate these "Craft Forward" review sites but this result represents not only the number of breweries now in the UK but also the increasing quality of beers that they are producing. The three breweries representing the UK are Pressure Drop, Weird Beard and Siren coming it at 10, 5 and 2 respectively. I was thrilled to see Weird Beard get the recognition they deserve. I've been following Gregg and Bryan's progress with keen interest over the past couple of years, and talked about their beers here, here and on the Beertalkers podcast where their excellent Mariana Trench faced off against Dogfish Head 60 minute IPA and came out triumphant. I've heard that Pressure Drop, Weird Beard and Siren might be doing some collaboration brews in the future so keep an eye out for those. I was also pleased to see the San Diego Brewery, Modern Times at number 9. It was started up in early 2013 by Jacob McKean, communications guy at Stone. Here he explains why he opened the brewery. With the experimental homebrew writer, Michael Tonsmeire, on board as a consultant it could only mean that there were going to be some out of the ordinary brewing going on. If you are a homebrewer and you haven't already, do check out Michael's site The Mad Fermentationist. His American Sour Beers book is out in the UK soon. His methodical approach to recipe testing and experimentation really appeals to the scientist in me. Number 3 in the list is the intriguing Bevog Brewery from Austria. We bought some of their range from the Independent Spirit of Bath while down in the Westcountry recently. They stand out on the shelf with Grimm-like monsters illustrated beautifully on their labels. As far as I can tell Tak is a dog like creature who likes to play with wheels. 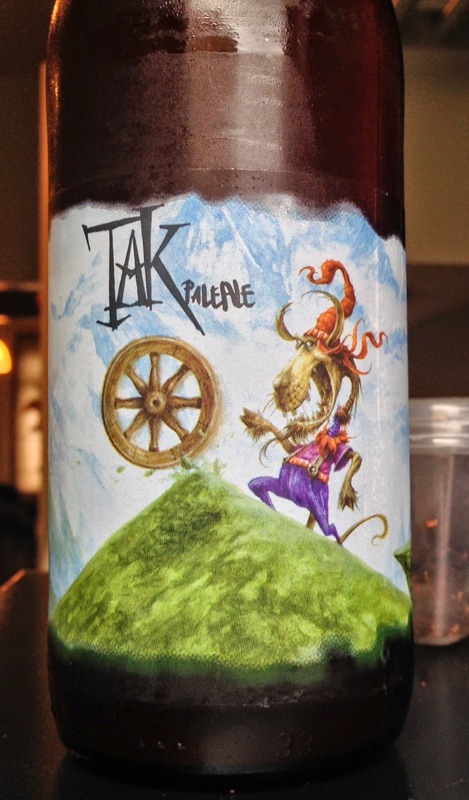 Tak Pale ale is the Bevog's flagship beer and the first that was commercially brewed in 2013. Smells of fresh lemony hops with a well-rounded tangy flavour. Slightly dusty and medicinal, but refreshing. The impact of the hops doesn't last though. As we go down the glass the malty dust takes over in a satisfying cakeyness. 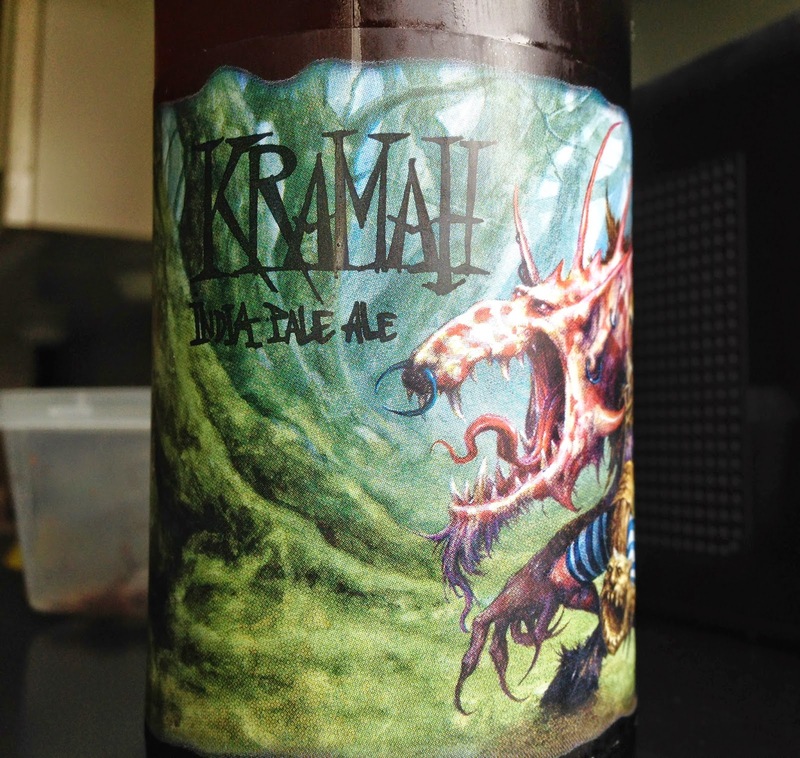 Kramah is a big bold scary IPA or that's the idea anyway. As expected there is a big hop presence in this beer but it does lack the vibrancy and clarity of flavour I expected. The bitterness is a little too subdued and muffled for my liking. The Bevog beers are available at Independent Spirits of Bath and Ales By Mail. The whole top ten new breweries list is here.